CC Sabathia had retired 12 of the last 13 men he faced. It was an impressive rebound for the 37-year-old veteran after an inauspicious start saw him allow three runs on three hits, two walks and a hit-by-pitch through the first two innings of Friday night’s ALDS Game 2. The Yankee bats came to play this night though, improbably chasing Indians ace Corey Kluber with six runs in just 2 and 2/3 innings. They tacked on another pair in the fifth when Greg Bird wrapped a Steve Clevinger pitch around the right field foul pole for a skyscraping two-run homer. An 8-3 lead was a big enough leash to let Sabathia work out his early issues, and the big lefty had done just that. There were some gripes when Joe Girardi pulled Sabathia in the bottom of the sixth after just 77 pitches. Sabathia opened the inning with a four-pitch walk to Carlos Santana, his only blip in the previous three-plus innings, but subsequently retired Jay Bruce on a soft lineout to Didi Gregorius. Still, the Yanks were just ten outs away from evening the series at one game apiece and moving it back home to New York. Ten outs shouldn’t have been much to ask from the game’s deepest and most dominant bullpen, one that had successfully registered an absurd 26 outs just three nights earlier in Tuesday’s 8-4 Wild Card win over the Twins. Chad Green, one of Tuesday’s heroes, relieved Sabathia and quickly notched the inning’s second out before Yan Gomes rocketed a double off the wall in left. Then, with two outs and runners on second and third, the game, season and possibly future of the Yankee organization shifted dramatically. With a chance to claw back into the game, Cleveland manager Terry Francona pinch-hit the lefty Lonnie Chisenhall for light-hitting Giovanny Urshela. Green got ahead quickly, blowing two fastballs by Chisenhall, and then went back to the well at 0-2. Chisenhall fouled it back. He did the same to the next pitch. And the next. And the next. Green’s seventh consecutive fastball rode too far inside and clipped Chisenhall’s hand. The umpire called for the hit-by-pitch, and the batter turned to take his base. Problem was, the ball probably didn’t hit Chisenhall at all. Gary Sanchez knew right away, and he said so. The ball seemed to have hit off the end of Chisenhall’s bat, not his hand. It was a foul tip, and because Sanchez held on, it should have been strike three and the end of the inning. Seconds ticked by as the broadcast examined the pitch from different angles. Girardi motioned from the dugout that he might issue a challenge. More seconds ticked by. Then…nothing. The entire sequence, from the instant the umpire called for the phantom hit-by-pitch to the moment Green dealt again and resigned Girardi to his decision, took 69 seconds. It would be only 25 more before Francisco Lindor crushed a grand slam high off the foul pole in right field to cut the score to 8-7. Two innings later, David Robertson (working his fifth inning over two appearances since Tuesday) gave up a game-tying solo shot to Bruce. Baseball-Reference says the two Cleveland homers cut the Yankees’ win probability from 91 to 39 percent, but you’ll forgive Yankee fans for putting the true number at zero. The offense stranded runners in scoring position in the ninth and tenth before getting the leadoff man to second base to start the eleventh. Pinch-runner Ronald Torreyes was promptly picked off. It took until the bottom of the 13th for the Tribe to finally put an end to the misery, when Gomes lined pitch down the third base line to score Austin Jackson and give Cleveland a 9-8 win and commanding 2-0 lead in series. Every team starts the game with two Manager Challenges. Additionally, beginning in the eighth inning, managers with no remaining challenges can still request, but not insist, that the umpiring crew review a play (a request which they would almost assuredly oblige on any close call given the stakes and stage of the game). Girardi issued his first challenge to escape the bottom of the first inning, getting Edwin Encarnacion called out at second base when he came off the bag following a gruesome ankle injury. Uncouth technicality or not, the overturned call meant Girardi kept both his challenges. He still held them at the time of the sixth-inning incident. The best case scenario. The call is overturned, Chisenhall is called out on strikes and the inning and threat are both over. Cleveland’s run expectancy in the bottom of the sixth goes from .73 runs (bases loaded, two outs) to zero (end of inning). The Yankees come to bat in the seventh with an 8-3 lead still intact. If Girardi opts to challenge, the absolute worst-case scenario is that the umpires uphold the call or find the replay inconclusive. In that instance, Chisenhall goes to first, Lindor bats with the bases loaded, and Girardi has only one challenge remaining to navigate the next one and 1/3 innings (at which point the eighth inning request period comes into play). Cleveland’s sixth-inning run expectancy stays at .73 runs. The absolute only difference between this and outcome B is that Girardi doesn’t risk losing one of his two challenges. And again, once the eighth inning arrives, any close call is probably getting reviewed regardless. In this scenario, Cleveland’s run expectancy remains at .73 runs. Of course, we know in retrospect that Lindor turned that .73 into an even 4.0. There is no perceivable downside to challenging the play. The odds that multiple higher-leverage moments might occur in the next inning (or even the rest of the game) are incredibly remote. Even if those moments did arise, the odds that they’d be challengeable with a reasonable chance for overturn? Girardi seemed unconvinced even in his own answers, bouncing between explanations. When pressed, he admitted that he was indeed the one who told the umpires that there wouldn’t be a challenge, and the umpiring crew never specifically ruled that too much time had elapsed. Bafflingly, he then doubled, tripled and quadrupled down on his pitcher-rhythm explanation over the course of a five-minute press conference. 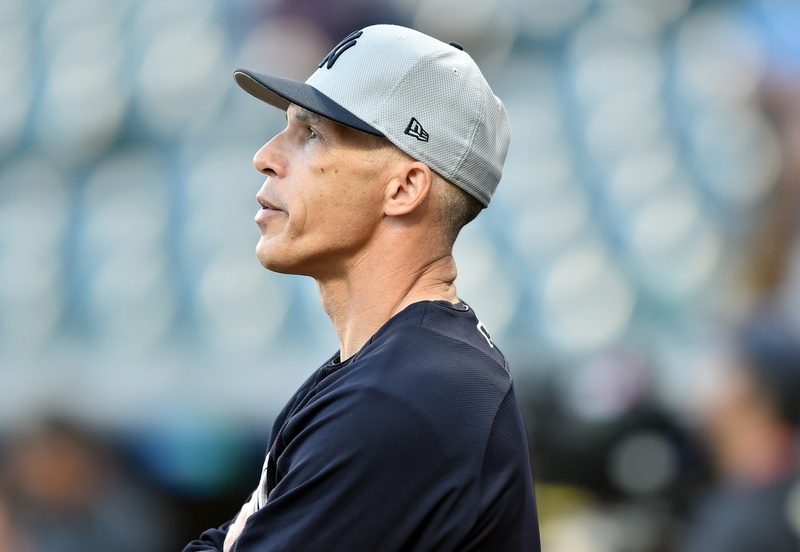 Joe Girardi has taken a lot of grief over his tenure as Yankee manager, much of it undeserved. He has been and remains one of the better managers in baseball, and has routinely helped the team overperform peripherals and remain relevant in seasons in which they had no business contending. Even the best managers make mistakes, and mistakes can and usually should be forgiven, even on an October stage. If Chad Green makes a better pitch, after all, none of us are even talking about this. The on-field blunder is one thing. To offer up an incomprehensible explanation and take no accountability for it afterward is quite another. To say “there was nothing that said (Chisenhall) was not hit,” and blatantly disregard what his own catcher adamantly told him is another still. In one fell swoop, Girardi displayed a complete mistrust of his players, an appeal to his own authority on matters of pitcher rhythm, and contempt for any logical accountability. After the game, reports surfaced that Aroldis Chapman liked an Instagram post that referred to Girardi as ‘a complete imbecile.’ The stupidity of that action aside, it is now a real question as to whether Girardi still has the locker room. It is a real question as to whether Girardi can be trusted to not only be accountable for his mistakes, but to learn from them. It is a real question as to whether Girardi should continue to manage this team. The season is not yet quite over, and we aren’t likely to get answers to any of those questions until it is. The Yankees and their manager can render them moot with an improbable comeback beginning Sunday night at Yankee Stadium. It doesn’t look promising. Andrew Gargano writes about baseball at BP Bronx, Banished to the Pen and Mattingly's Sideburns. You can follow him on Twitter @andrewjgargano and email him at andrewjgargano@gmail.com.